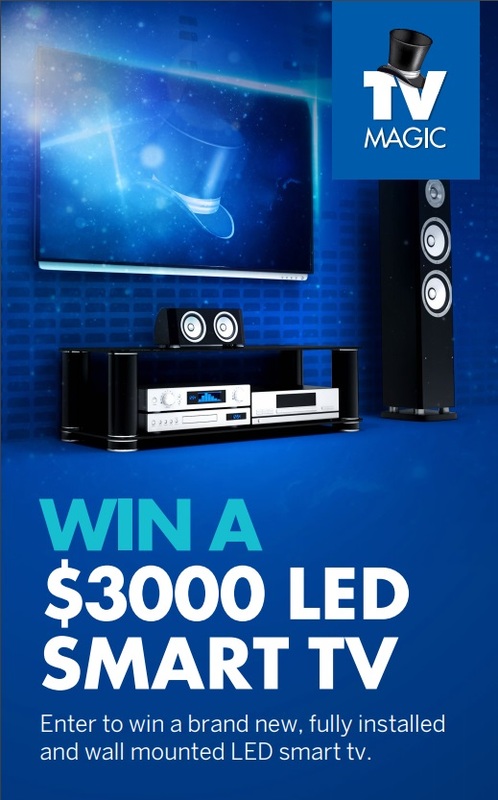 Win a chance to Win a $3000 TV!! Fully Installed & Wall Mounted! 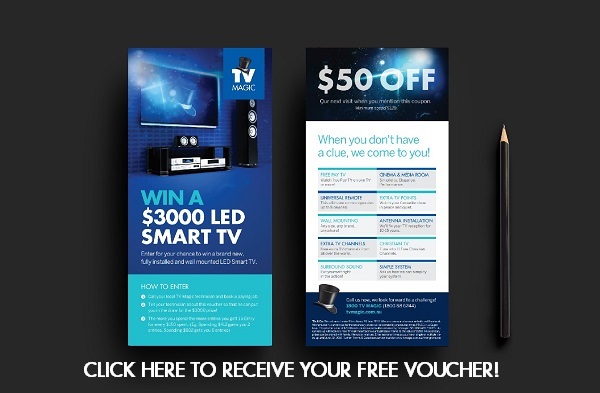 Tell your technician about the voucher & book a paying job. Receive a $50 discount. (Minimum Spend $120) and your entries are then automatically entered into the system. $4750 worth of prizes up for grabs. 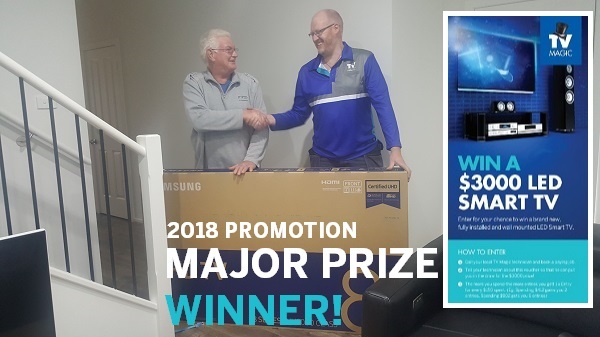 Main Prize - 1x Super Large New LED/OLED/Smart Screen Television up to the value of $3000 professionally installed/wall mounted by TV Magic. 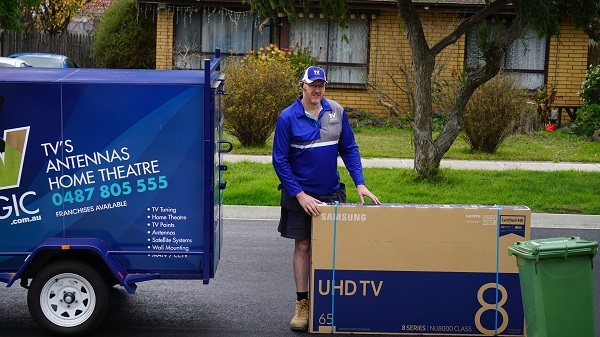 4x Runner Up prizes of Free In Home TV Wall Mounting Service of a television of your choice/purchase up the value of $350. Voucher holder must agree on a mutually convenient time with the local technician for the $50 off discount. Whilst every precaution will be taken to avoid delays, sometimes full paying customers will take priority. Minimum spend of $120 applies. Prize candidates/winners must have a want or need to wall mount a TV to be eligible for any prize/s. In the unlikely event that prize candidates/winners have refunded, unpaid or overdue invoices, these entries will be disqualified. All entrants who purchase/use our services will receive 1 x entry into the draw for every $150 spent & paid for. All 5x prizes are drawn random selection June 30, 2018. Enter as many times as you wish across multiple visits up until June 30. The more you spend the more entries you will receive. Winners will be announced by email, sms & facebook. TV Magic reserves the right to delay/cancel or refuse any of the prize grants that fall outside of our normal serviced territories. TVs and prizes cannot be redeemable or negotiated for cash. 10x lucky candidates will be drawn by random selection. Candidates will be contacted in order for the chance to win prizes 1-5. Win a chance to win is defined by the following conditions: All prize winners/candidates agree to the following conditions: a) having their prize/ wall mounting installation done @ a mutually convenient time for both parties; b) agreeing on brand/size/preference as recommended by TV magic c) In the unlikely event that the cost of the installation exceeds $350 of parts+labour. The winner agrees to pay any additional expenses. TV Magic promises to notify you prior to commencing any work d) You agree to participate and sign a media release form for marketing purposes. TV Magic will not reveal your full name/address in any medium. By signing the media release form you will give TV Magic permission to use the content in any manner we choose. Mediums used and content we may require from you may include photos, videos, video recording, video testimony, social media, online marketing, and allowing invitees (up to 20 persons) into your premises during/after installation for a period of up to 2hours after installation. 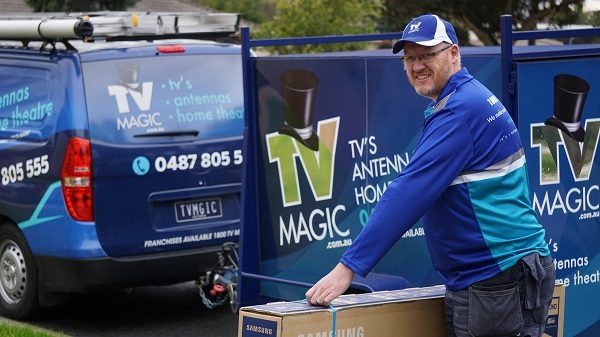 You agree to assist TV Magic in displaying our professional work to colleagues, neighbours and friends that you or TV Magic has personally invited during these 2 hours. 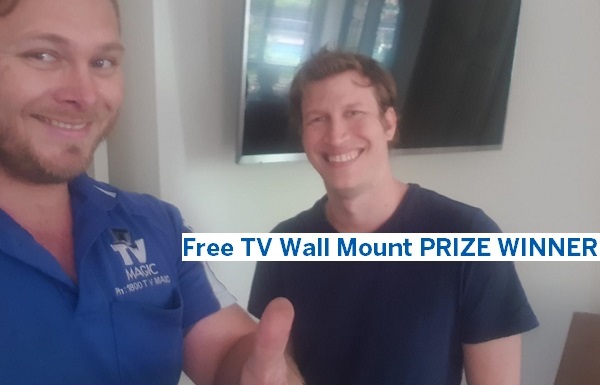 e) All prize winners must allow TV Magic to follow through with a TV wall installation job. f) Note: Non Home Owners - TV Magic may ask to site written permission to wall mount a TV on the wall from their landlords/ owners. g) TV Magic will not be held responsible/liable for any damage (major or minor) caused to walls by removal of the TV from the wall after installation time/date. 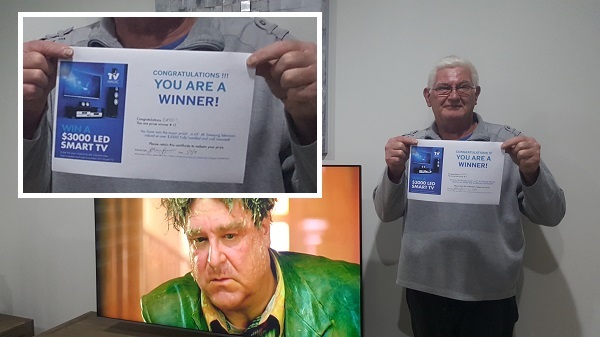 h) Prize winners who already have a TV on the wall and wish to upgrade may choose to have their new prize TV wall mounted in exchange of the existing TV or wall mount the prize TV in a new position/location of the premises. h) TV Magic reserves the right to ultimately accept/reject any position/location chosen for a TV wall mounting installation. i) Winners & Prize candidates will be given a maximum of 30 days to provide suitable dates/times to remain eligible to receive their prize. j) Limit 1x prize per customer/winner. k) TV Magic reseves the right exercise the final say on all conditions/decisions made. Our decision is final.